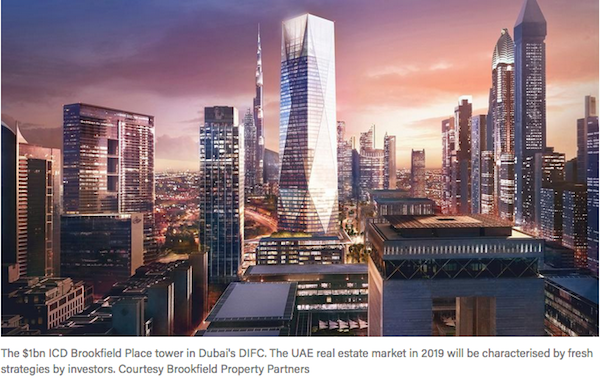 The UAE real estate market is set to buoy this year as cost-conscious investors and property owners seek fresh strategies to maximise returns in a competitive market, according to a 2019 outlook report from consultancy JLL. Among the tactics increasing in popularity are investment in under-exploited asset classes such as industrial; sale-and-leaseback deals through which owners sell off real estate then occupy it on a rental basis to free up capital; establishment of real estate investment trusts (Reits), and flexible office working by enterprises. “While market conditions are likely to remain challenging in 2019, investors and occupiers have the opportunity to introduce new strategies to enhance their performance,” Craig Plumb, head of research at JLL Mena, told media on Monday. Evolving technology offers landlords opportunities to cut costs by better targeting investors and identifying inefficiencies. “New ‘prop-tech [property technology] solutions have the potential to drive smarter and more efficient means for predicting the market, purchasing transactions and managing assets,” said Thierry Delvaux, chief executive of JLL Mena, in a statement. Meanwhile, digitisation of real estate assets – for example, equipping them with technology to measure energy consumption and occupancy levels – will be increasingly seen as an “essential building block” in the creation of smart buildings and smart cities, he added. The UAE has witnessed a real estate market decline in the past four years on the back of lower oil prices, which have crimped consumer purchasing power and driven a fight for affordability across the Emirates. Residential sales and rental prices have fallen, but developers are bringing new, lower cost products to market to meet demand. At the same time, UAE real estate companies are seeking to consolidate to rebuild their profits as renewed economic growth buoys investor sentiment and re-energises the market. Government initiatives such as Abu Dhabi’s Dh50 billion economic stimulus, set to be rolled out this year, as well as new visa rules to encourage expatriates to stay longer and invest in the Emirates, are set to boost the real estate market. Conditions softened across most sectors of the UAE real estate market in 2018, JLL’s report said. “The prospects for 2019 will depend on how quickly the regulatory changes enacted last year begin to generate additional demand,” it said. Other macroeconomic factors are set to provide a much-needed fillip to the market, in particular the global rise of e-commerce. The digitisation of the retail supply chain will boost demand for specialist industrial facilities including warehouses, while traditional malls will incorporate more innovative entertainment and dining concepts to drive footfall and spend, JLL said. Meanwhile, the global adoption of flexible office space to cut costs is one of the biggest shifts the real estate industry is witnessing across the region, according to the report. In 2018, the number of co-working and serviced office space projects accounted for 69,000 square metres of total commercial space across Europe, the Middle East and Asia, compared to just 30,000sqm in 2010, the report said. In the hospitality sector, 2018 saw the start of a trend in hotel sales – such as that initiated by Dubai-listed Emaar Hospitality – as owners sought a more ‘asset light’ business model. This is likely to continue into 2019, JLL said.